FamilyFarmed‘s annual Giving campaign is under way, and to highlight the work we do to build a better food system, we are running a series of profiles of great businesses that have participated in our programs. Today we look at FamilyFarmed’s Good Food Accelerator through the eyes of Maya-Camille Broussard of Justice of the Pies, who graduated in April in the program’s 3rd cohort of entrepreneur Fellows. 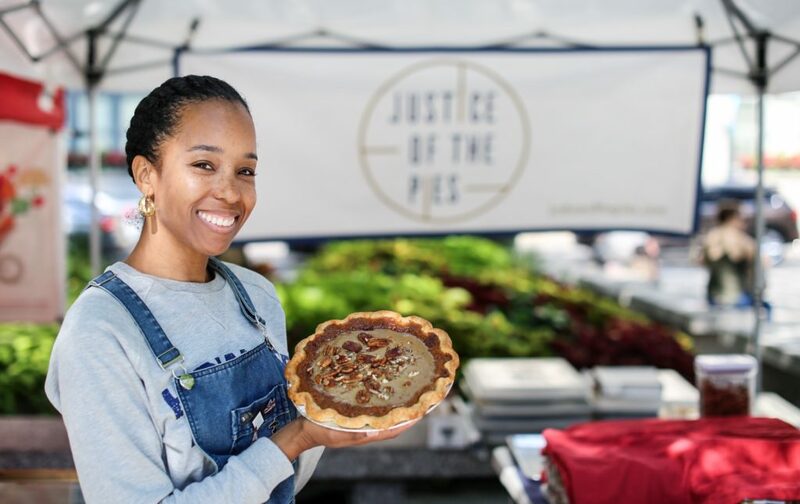 Maya-Camille Broussard’s Justice of the Pies specializes in sumptuous sweet and savory pies and tarts that she sells in a growing number of locations, including several Whole Foods Market stores in Chicago and the summer farmers market at Daley Plaza in The Loop. Justice of the Pies’ Thanksgiving treats were recently featured on Lou Malnati’s Tastes of Chicago e-commerce site. She graduated in April in the third cohort of FamilyFarmed’s Good Food Accelerator, and has nothing but praise for how the program has helped her build her business. “I often tell people it felt like getting an MBA in six months, concentrating on running a food business, but everything from supply chain to marketing to investing, how to work with investors. it was extremely intense, but it was definitely beneficial for my business,” Maya said. Maya added that the industry-leading mentors who work with the Accelerator Fellows and the direct introductions the program provides to suppliers, distributors, consultants and others in the food industry have been especially helpful. As for the name, Stephen J. Broussard — Maya’s late father — was a criminal defense attorney whose hobby was baking pies. 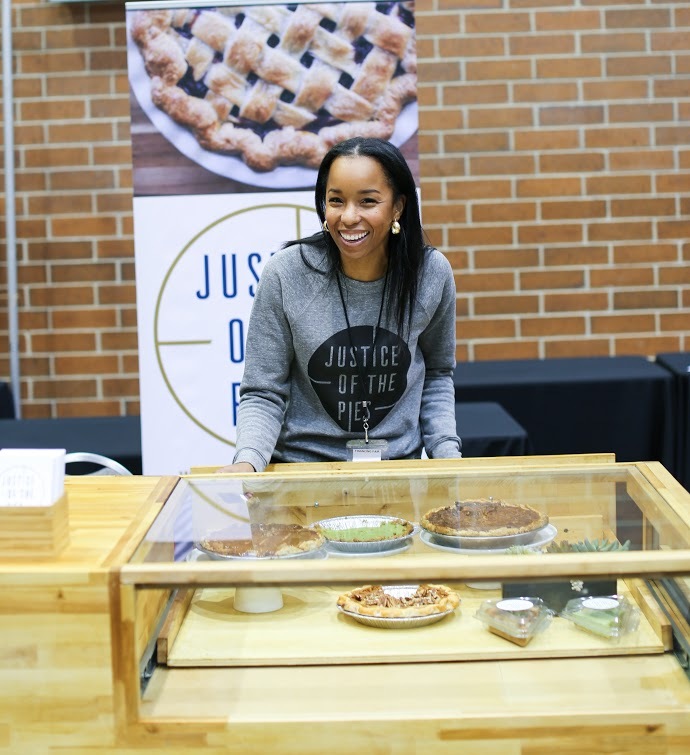 She created Justice of the Pies in 2014 to “celebrate his love of pies and to honor his belief that people need second chances.” Her company also partners with non-profits that provide culinary arts experiences to young people in underserved communities. 1. Delicious, healthy food, accessible to all, produced as close to home as possible by family farmers and producers who use sustainable, humane and fair practices. 2. A fast-growing movement creating vast numbers of jobs and economic development by providing people with food that matches their values. Contribute today to support programs such as our Good Food Accelerator at http://www.familyfarmed.org/donate/. Support from Good Foodies like you helps realize our vision of Good Food on Every Table — we can’t do it without you! This entry was posted in Uncategorized and tagged Daley Plaza Farmers Market, FamilyFarmed, Good Food Accelerator, Justice of the Pies, Lou Malnati's Tastes of Chicago, Maya-Camille Broussard, Whole Foods Market. Bookmark the permalink. ← It’s A FamilyFarmed Birthday Fundraising Faceoff!